The heart has four chambers. 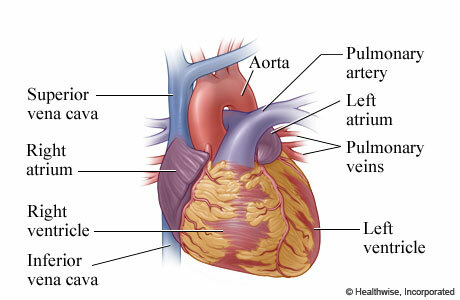 The two upper chambers are called atria (the right atrium and the left atrium), and the two lower chambers are called ventricles. Normally, the heartbeat starts in the right atrium in a group of special heart cells called the sinoatrial (or sinus) node. These cells act as a pacemaker for the heart. The heart's pacemaker sends out an electrical signal (impulse) that spreads throughout the heart along electrical pathways. These pathways transmit the signal from the upper to the lower chambers of the heart, which causes the heart muscle to contract. 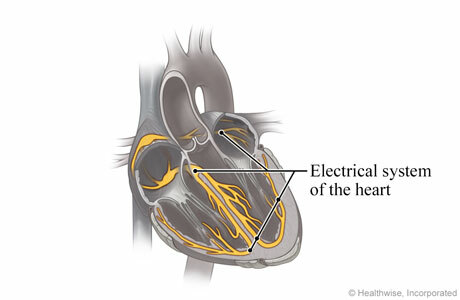 Regular, rhythmic electrical signals keep the heart pumping blood to the lungs and the body.